$25 admission. All proceeds benefit music education, the Dayton Philharmonic Orchestra, and the DPVA. 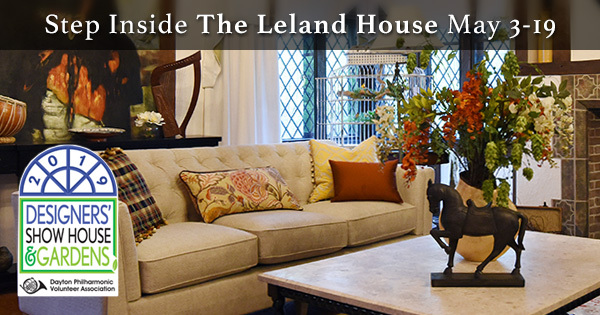 The 2019 Designers’ Show House and Gardens – Open May 3, 2019 through May 19, 2019 at The Leland House. 2019 will be an exciting year as the Dayton Philharmonic Volunteer Association (DPVA) present the 40th year of Designers’ Show House and Gardens at The Leland Home located at 1375 E. Siebenthaler Ave. adjacent to Wegerzyn Gardens MetroPark. Daily admission for the show house is $25. We will have Food Truck Friday's, High Teas on Mondays ($40), our famous Pine Club Burger Party ($50), the Bach Cafe, a Musique Boutique and presentations/demonstrations from Designers and other professionals. Since 1979, when the DPVA presented the first Designer’s Show House, we have raised more than $2.3 million to support the Dayton Philharmonic Orchestra, music education and scholarships. Find more events like "DPVA Designers Show House & Gardens 2019"
The DPVA was founded in 1952 and supports the Dayton Philharmonic Orchestra in the areas of education, promotion, fundraising and membership development.